They died of blunt-force trauma, according to the National Wildlife Health Center in Madison, Wis. 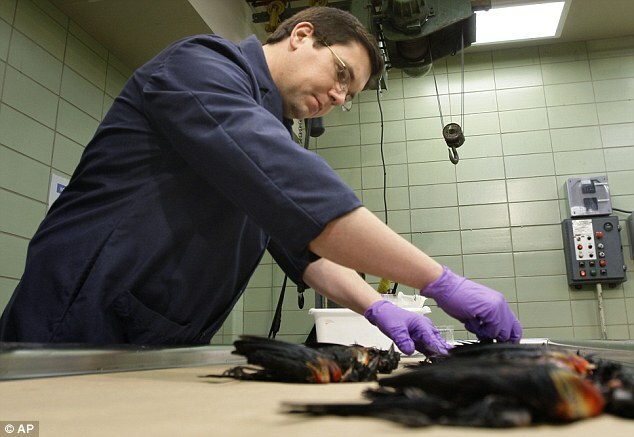 Samples of the blackbirds and others from a separate mass die-off about the same time in Louisiana were brought to the little-known laboratory on Madison's west side for necropsies. "They died of impact force to their bodies," said Scott Wright, chief of disease investigations at the center. He said the birds clearly showed signs of bruises. The Arkansas Game and Fish Commission said tests for evidence of pesticide poisoning were negative. Als ik vanaf tientallen meters naar beneden val, zal ik er ook blauwe plekken aan over houden haha..
Ik vind de verklaring magertjes. Maar ja wie ben ik? In het verleden zijn er vaker berichten geweest over vreemde patronen/figuren/strepen op satellietbeelden. Nu komen er steeds meer berichten over de vreemde vlekken die vlak voordat de vogels uit de lucht vielen op de radar te zien waren. Het is dus wel degelijk belangrijk om het weer (satellietbeelden) goed in de gaten te houden. Hier weer een bericht over dode vogels....én de 'Doemdenkers' worden er ook wederom weer gekscherend bijgehaald....Waar is dat voor nodig? Iedere keer als er een dergelijk verschijnt, komt gelijk de relatie met Doemdenkers om de hoek. Waar slaat dat in godsnaam op? @dolle misschien heeft het er ook wel wat mee te maken.. maar die doemdenkers maken er het einde van de wereld van.. ik eerder het einde van een cyclus en het begin van een nieuwe. "According to biblical principles, a marriage is between a man and a woman. So we have to say, 'What happens when a nation makes a decision that goes against God's principles?' Well, often what happens is that nature begins to speak to us." Sage, if completely unfounded, wisdom from "respected prophet" Cindy Jacobs. In the video below, Jacobs connects many important dots in the latest acts by a wrathful God. 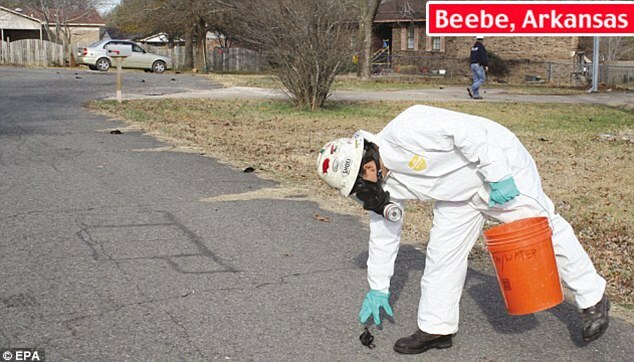 First, the Arkansas city where all those dead birds fell out of the sky was called Bebee. The current governor of Arkansas? Also named Bebee. See where I'm going with this? Second, DADT was originally put forward by former governor of Arkansas, Bill Clinton. Now is it starting to make sense? Okay, idiots, it goes like this: God is mad that we repealed Don't Ask Don't Tell, because the more honest we allow people to be about their sexuality, the more likely they are to someday marry one another, in violation of "biblical principles." So, God decided to kill some blackbirds in the sky. He wanted to connect the bird massacre to Bill Clinton, because he introduced DADT, but he felt like killing them over Clinton, Arkansas would be too obvious. 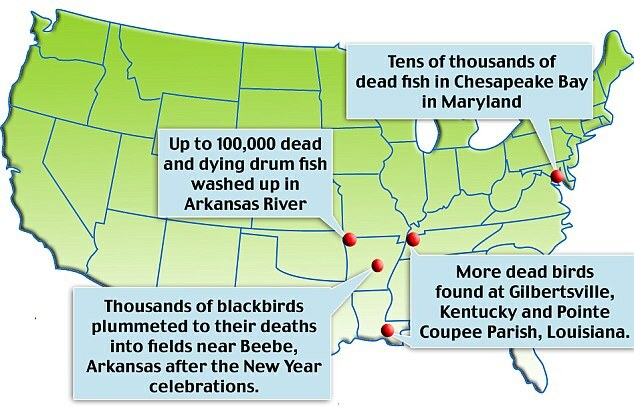 So he murdered those blackbirds in Bebee, AR, to connect them to the current governor, who connects them to the former governor. Additionally, this prophet is a lunatic dressed in a purple leopard-print ensemble. I don't see how you could need more proof that God works in mysterious ways. 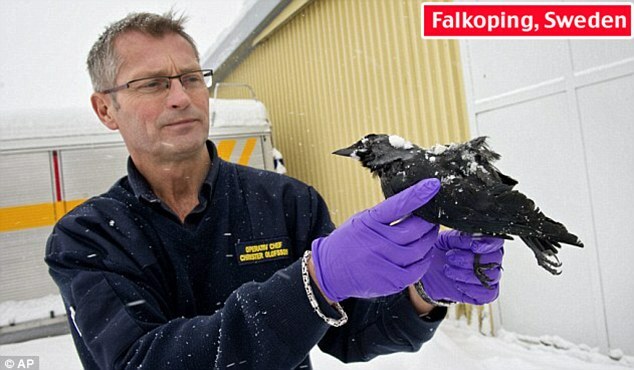 Experts were today carrying out tests on around 50 jackdaws found dead in a street in Falkoping, Sweden, that appear to have suffered the same fate as thousands of their cousins who fell from the sky in separate incidents in the U.S.
Edmir Manoel Ferreira, president of the Federation of Fishermen's Colony of Parana, said the deaths had been discovered since Thursday last week. 'On Thursday we began to find a lot of dead fish. One community had to bury 15 tons alone. 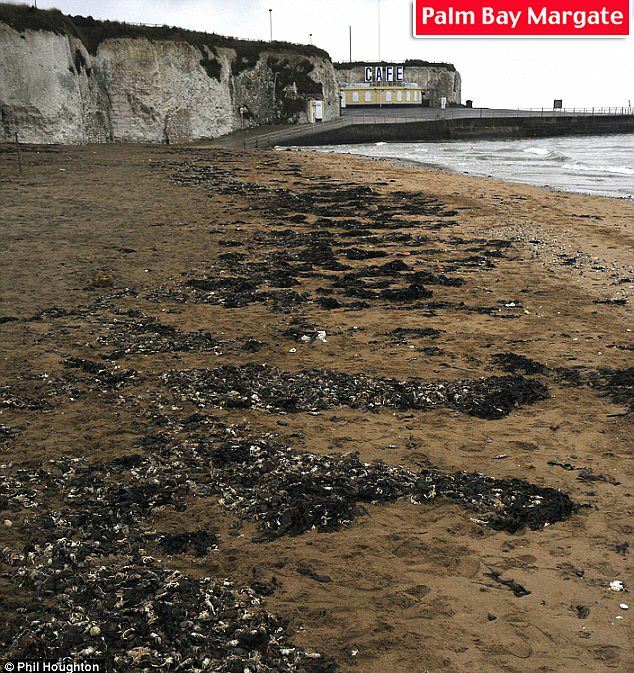 And the cold weather in Britain has been blamed for the deaths of 40,000 Velvet swimming crabs - also known as 'devil' crabs - found littering beaches in Thanet. Tony Childs, Thanet Coast Project Manager, said: 'We had a crash in numbers last year and we hadn't expected such a large population. 'As happens with the circle of life in nature, we expect the crabs to be naturally dispersed from our shores very quickly by our local seagulls. 'They don't hit a power line for no reason,' he said. 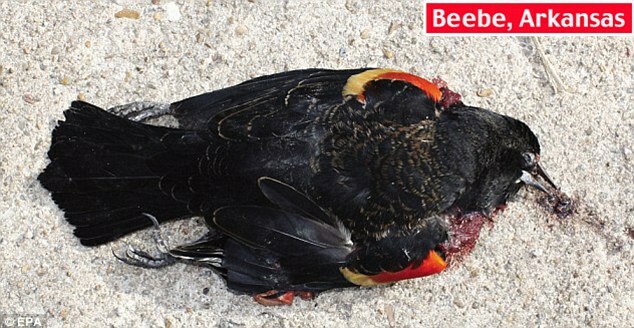 New Year's revellers spent the holiday weekend cleaning up dead red-winged blackbirds in Beebe. 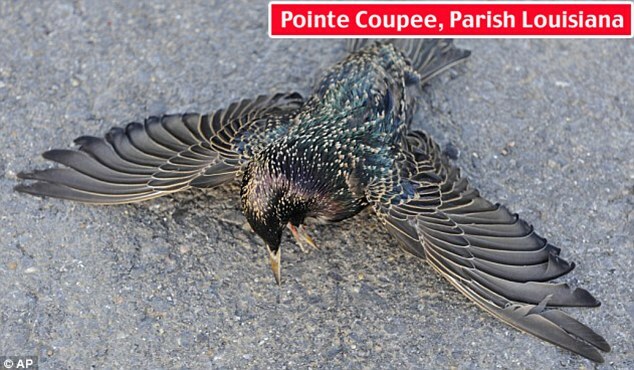 Some blamed the bad weather, while others said one confused bird could have led the group into a fatal plunge. Karen Rowe, an ornithologist with the Arkansas Game and Fish Commission, said: 'The blackbirds were flying at rooftop level instead of treetop level. It took five months to get the diagnosis - an E. coli infection of the air sacs in their skulls. They blame the deaths - affecting menhaden, spots and croakers - on the stress of cold water. Red-winged blackbirds are among North America's most abundant birds, with somewhere between 100million and 200million nationwide, according to the Cornell Lab of Ornithology in Ithaca, New York. Over de hele wereld lijken de plotseling dode dieren niet aan te slepen. Een regen aan dode vogels in Amerika. Dode duiven in Italië en ook dode vissen komen steeds vaker voor. Nu is Helmond aan de beurt. De dierenambulance in de stad heeft de afgelopen dagen namelijk honderden dode vissen uit vijvers moeten vissen. Doordat er veel vijvers bevroren waren met daar bovenop een laag sneeuw, zijn de vissen in de problemen gekomen. Nu al het water ontdooit, komen er op veel plekken dode vissen bovendrijven. Nadat er in de afgelopen dagen in enkele vijvers dode vissen waren gevonden heeft de gemeente de dierenambulance opdracht gegeven alle vijvers te controleren. Volgens een gemeentewoordvoerder hebben de waterplanten door de ijslaag en de sneeuwlaag heen te weinig zonlicht gekregen. De planten konden daardoor te weinig zuurstof afscheiden. Het hakken van een wak in het ijs was geen optie omdat de vissen in paniek zouden raken door de trillingen. Dus de aluhoedjes kunnen weer af. Het lag in dit geval aan de strenge winter. TOWN OF STOCKTON, Wis. -- An investigation is under way after 200 dead cows were found in a field in the Town of Stockton. Investigators with the Portage County sheriff's office said the owner of the cattle has been working with a local veterinarian and it's believed the animals died from the IBR/BVD virus. The virus can cause respiratory and reproductive problems. WSAW reported samples from the dead cows have been sent to Madison for testing. 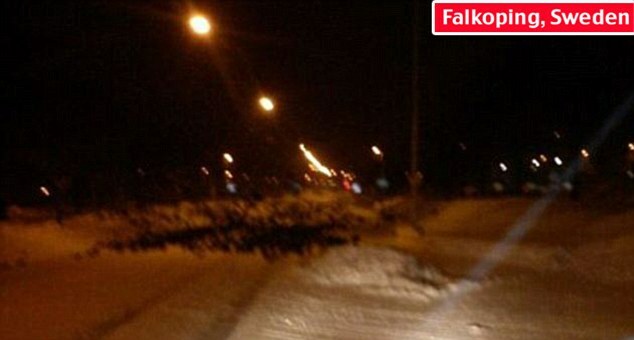 Authorities said there is no threat to humans or other animals. To find out more on this, visit Channel 3000's Search page. More birds falling from the sky? I have no words to describe how floored I am to see this MAJOR UNHEARD OF ACTIVITY! PLEASE PLEASE PLEASE PASS THIS ON AS THIS IS MAJOR! Credits go to YT user http://youtube.com/HAARPwillNOTbeSILENT for the HAARP signal clip. Check out his channel! ~new: http://goo.gl/IURGQ & http://goo.gl/YsjMH Amateur Truther Counselor on Skype: exomatrix is my handle! All can be recorded (dual channel) for everyone to learn from! 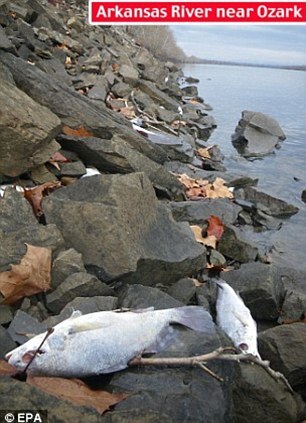 More dead animals have continued to show up today - as 100 dead FISH add to the toll. Welsh families awoke this morning to find 100 dead carp, bream and roach fish floating in the waters of the Monmouthshire and Brecon Canal in Cwmbran. Colin Breeze, 62, spotted them and has now written to Torfaen Council to try and solve the puzzle. He said: "Perhaps it is the end of the world. "I think they could have been frozen in the ice, but at the same time it was a bit of a shock especially with all these animal deaths we keep hearing about. 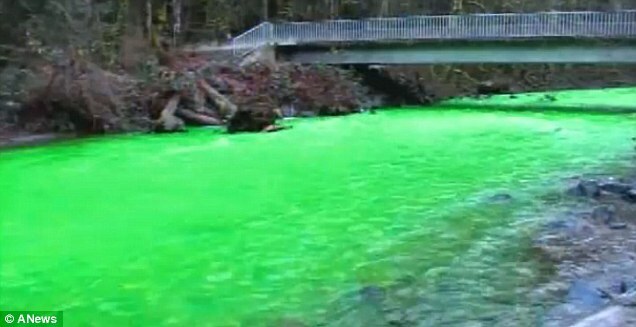 A spokeswoman for Environment Agency Wales said they had visited the site and said the council would remove the fish. She said a lack of oxygen was the most likely reason for the fish deaths, as readings they took were very low. A spokeswoman for Torfaen council confirmed they would remove the fish today. The grisly discover comes after thousands of dead fish were found floating in Florida after a cold snap and 200 lifeless birds were discovered in Texas. 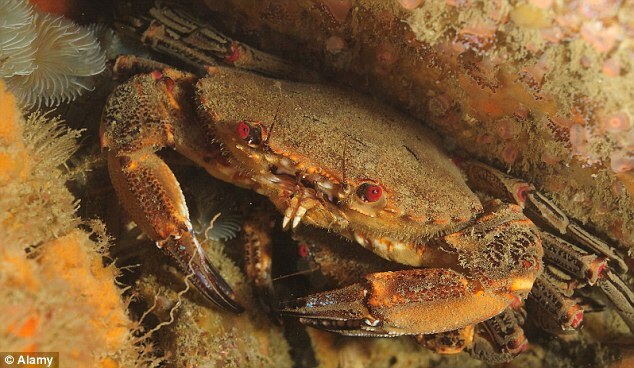 More fishy deaths have seen 100 tons of sardines, croaker and catfish wash up on the Brazilian coast, New Zealand have hundreds of deceased fish and Britain find 40,000 devil crabs. 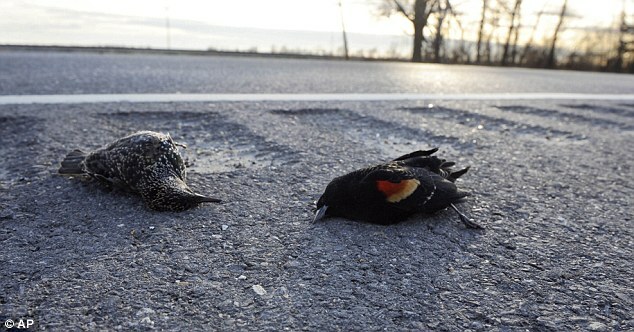 Yesterday 300 grackles fell from the sky in Alabama and were found along the l-65 highway. Samples are being analysed to work out their cause of death, but one theory is that they collided with a large truck. A conservation officer with the area's Inuit government estimated late last week that hundreds of adult and young seals have died in the area between Hopedale and Makkovik this winter. A grim report prepared by Russia’s Ministry for Extraordinary Situations (MCHS) is warning today that our world is currently “under attack” from “poisonous space clouds” penetrating our planets upper atmosphere due to the “accelerated movement” of the Earth’s magnetic poles and are responsible for the many reports of mass animal deaths being reported all around the globe. In our previous report, Pole Shift Blamed For Russian Air Disaster, Closure Of US Airport, we had detailed how the shifting of our planets poles were wreaking havoc on planes having to adjust their air-fuel mixtures to compensate for distorted altitude readings in their computer avionic systems, and now this new MCHS report warns the situation is getting even worse. The name given to these deadly space clouds by Western scientists are Noctilucent Clouds (NLC’s) [photo 2nd left] and are described as tenuous cloud-like phenomena that are the “ragged-edge” of a much brighter and pervasive polar cloud layer called polar mesospheric clouds in the upper atmosphere, visible in a deep twilight. Noctilucent Clouds began to first appear over our Earth in 1885 as our world began its full assent into what is called the Industrial Revolution that has seen our planets human population rise from about 1 billion to over 7 billion today. Not just mysterious are these clouds, this report continues, but they are also deadly as they are comprised of the poisonous gas Hydrogen Cyanide which gives them their electric blue-like colour. Hydrogen Cyanide was first isolated from a blue dye (Prussian Blue) which had been known from 1704 but whose structure was unknown. It is now known to be a coordination polymer with a complex structure and an empirical formula of hydrated ferric ferrocyanide. In 1752, the French chemist Pierre Macquer made the important step of showing that Prussian blue could be converted to iron oxide plus a volatile component and that these could be used to reconstitute the dye. The new component was what we now know as hydrogen cyanide. Important to note, this report continues, is that Hydrogen Cyanide is also formed in interstellar clouds through one of two major pathways: via a neutral-neutral reaction (CH2 + N ? HCN + H) and via dissociative recombination (HCNH+ + e- ? HCN + H). The dissociative recombination pathway is dominant by 30%; however, the HCNH+ must be in its linear form. Dissociative recombination with its structural isomer, H2NC+ produces hydrogen isocyanide (HNC), exclusively. Upon the solar wind breeching our Earth’s magnetic field, this MCHS report asserts, these poisonous Hydrogen Cyanide Noctilucent Clouds would be carried down into the lower atmosphere where they could, literally, “poison in seconds” flocks of birds in its path, not mention the force of these winds by themselves would cause massive trauma and instantaneous death. Though this MCHS report does not say how long these breeches in our Earth’s magnetic will remain open allowing these poisonous space clouds to continue to cause mass death, it is instructive to note that though this phenomenon is new to our world today, the same cannot be said of the ancients. In her seminal work Battle Begins For Throne of This World: The Return of the Einherjar Warriors, the Sorcha Faal detailed how much the ancient myths of our forbearers are equaling the world we live in today, where men believe they are ‘gods’ while at the same time they begin the wholesale destruction of not only themselves, but all life forms on this planet we call Earth. And if these ancient myths are true, then, once again, the “overturning” of our arrogant human race is upon us all where the “balance” will be restored, but not without the deaths of billions. Where today stands the nations of the United States, Russia and China, a future history written of these times may very well describe them with the awe and reverence we do today for Atlantis, Mu and Lemuria, who, like us today, really believed they were in charge. 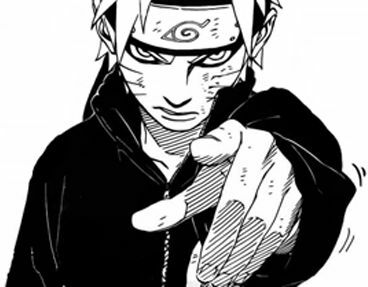 © January 8, 2011 EU and US all rights reserved. Permission to use this report in its entirety is granted under the condition it is linked back to its original source at WhatDoesItMean.Com.